Enchantingly spacious sculptures of sound that combine field recordings, deconstructed beats and distorted electronics; intuitive and emotional experimentations in liminal musical states. Lewis’ experiments with sound and visuals grew out of a strong interest for the like-minded projects of her musician dad Graham Lewis (of Wire and Dome), who also recently released albums on Editions Mego. Whether it’s pasta being drained in a colander or the acoustics of a medieval forest in Tuscany, Klara Lewis’ at once exciting and unnerving rhythmic compositions use found sounds as bona fide instruments. 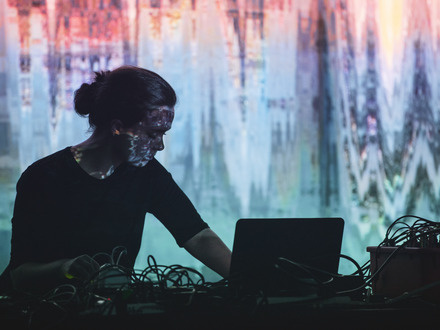 You’ll gleefully lose yourself as you wander through the enchanting and immersive maze of her sound sculptures, which combine abstracted field recordings, deconstructed beats and distorted electronics. When she was 5 years old, Klara Lewis visited a paint shop with her family, where she couldn’t help but bust a move to the aggro wham-thwack-splat of the store’s paint-mixing machines. The seeds of her fearless experimentation and spacious sonic inventions were planted right then. While her musically savvy parents introduced her to rhythms and melodies at a young age, and she also played the bass as a teenager, Lewis’s first use of field recordings at the age of 14 sparked a passion that has now translated into the backbone of her musical narratives, bringing to light all the knotted emotional layers wedged between more palpable textures. Since releasing Ett, her critically acclaimed debut, on Viennese experimental label Editions Mego in 2014, and being christened Emerging Artist of the Year by British tastemaker Mary Anne Hobbs, Lewis has been in high demand by festivals and labels alike. Last year, her ambient techno remix of a track for London act Factory Floor on DFA Records was an album standout. Lewis brings her intuitive experimentations in liminal musical states: hopeful yet melancholy, striking yet sparse—to Montréal. Presented as part of North-West Passage, a project by Insomnia, Intonal and MUTEK, with the support of the Nordic Council and the Quebec government.